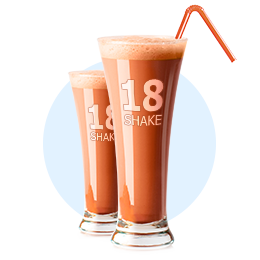 ﻿ 18 Shake - Official Site - Luxury Meal Replacement. New Formula. 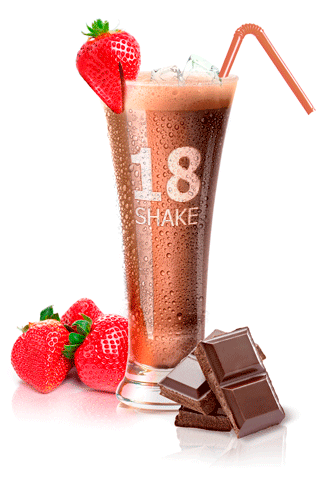 18Shake is a luxury meal replacement made in the USA from all-natural ingredients. It has no soy, artificial sweeteners or any other harmful ingredients found in many meal replacement products. Also, 18Shake is a gluten free product. Its high quality dual-protein formula and fiber will naturally help to reduce hunger and lose weight fast. We are so confident in our product that we will give you your money back if you do not see great results! Why is 18SHAKE so Effective? 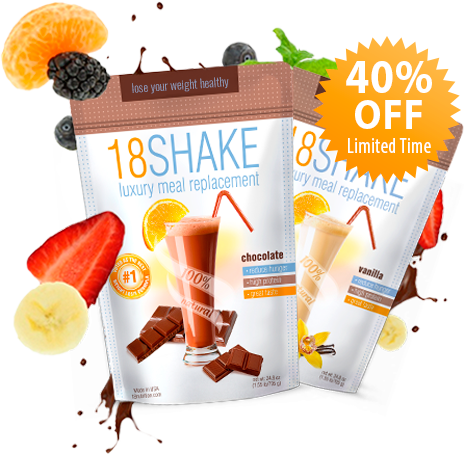 18shake is an innovative meal replacement shake made in the USA to deliver results in weight loss and for long-term health benefits. It's the best and most convenient alternative for regular meals. Meal replacement diets have become popular because of their simplicity and lack of restrictions. There is no systematic calorie counting, weighing of food or constant checking of different tables and charts. Many health experts highly recommend meal replacement diets for all those who want to see real results. The secret behind this product? It's simple, a yummy meal replacement shake with everything you need to lose weight. 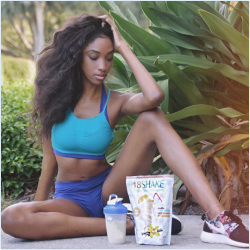 What makes a meal replacement shakes so powerful is you don't have to spend countless hours carefully selecting and prepping your meals. A delicious and healthy drink that contains fruits and protein only takes 2-3 minutes to prepare. 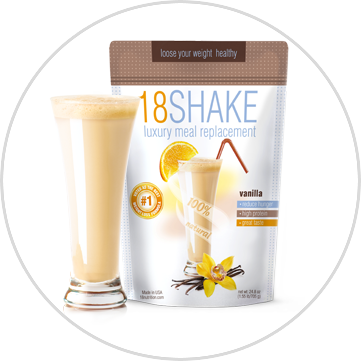 18Shake makes you feel full and has only 90 calories per serving which is approximately 5-7 times fewer than a conventional dinner. A reduction of calorie intake is the main principle of every diet and it really works! You have the convenience of an easy to prep and even easier to enjoy the mix of ingredients. 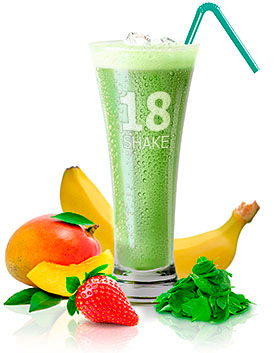 Simply replace one or two of your daily meals with 18Shake. It has a large number of nutrients needed by the body. 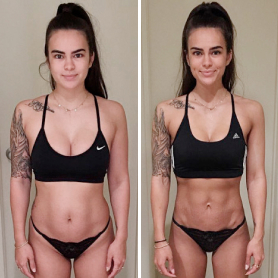 This meal replacement works wonders by giving you all the nutrients and vitamins that a big meal would have, without any of the excessive calories, fats, carbohydrates, or sugars. All you do is quickly blend these delicious powders and let the healthy protein and fiber keep you satisfied. You can enjoy it on the go and since it has just enough calories to give you the energy needed for a productive day, you'll be full of energy and completely satisfied. 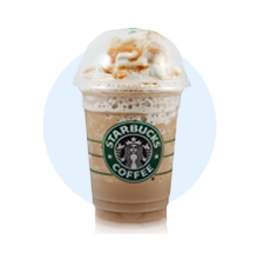 We recommend mixing 18Shake with milk for the best taste, also, you can find many recipes with different ingredients on the recipes page. 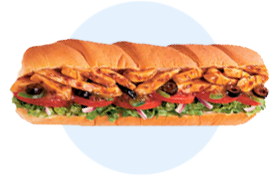 It is also a convenient and easy meal on the go! 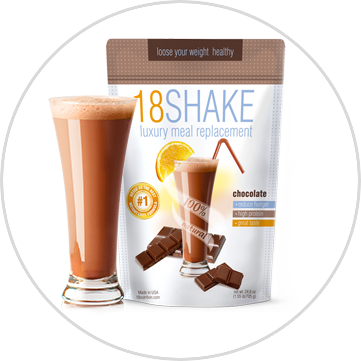 The secret of 18Shake lies in its high-quality ingredients that your body needs for healthy weight loss: WPC - whey protein concentrate, WPI - whey protein isolate, Fibersol-2, 24 vitamins and minerals. It is a combination of healthy non-GMO whey concentrate and whey isolate proteins. Protein takes more work to digest, metabolize, and use, which means you burn more calories processing them comparing with standard meal. It also takes longer to leave your stomach, so you feel full sooner and for a longer amount of time. WARNING: Try to stay away from meal replacements with soy protein, because the latest research shows potential dangers such as cancer and heart-related problems. Approximately 90% of soy in the USA is a genetically modified organism (GMO). One of the most effective ways to lose those extra pounds is to control hunger. 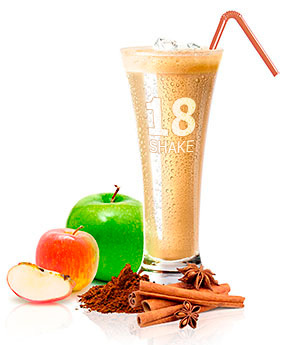 18shake contains patented fiber (Fibersol-2), which acts as an appetite suppressant and helps you stay full longer so you can resist eating more food than you need. * When you reduce calorie intake, you lose weight! Studies show that iodine is a necessary element for the thyroid to optimally function. Upping your iodine level will increase your body's metabolism. This in turn helps you shed those unwanted pounds. Since increasing sugar sensitivity is a critical goal in promoting weight loss, chromium can be quite beneficial in people trying to lose weight. It also processes carbohydrates and reduces hunger pangs. B-complex vitamins and weight loss go hand in hand, when all forms of it are taken together. They are absolutely essential for necessary metabolic processes such as red blood cell synthesis and the production of energy. Vitamin C helps to repair and regenerate tissues, protect against heart disease, aid in the absorption of iron, prevent scurvy, and decrease "bad" cholesterol and triglycerides. 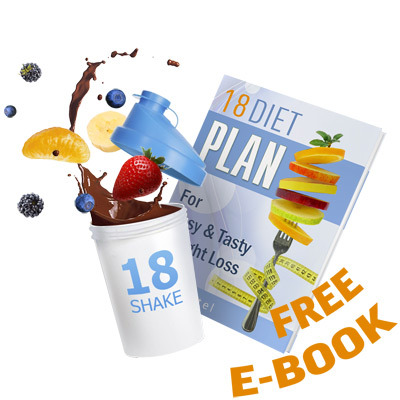 We at the 18Shake Company have written the 18 Meal Plan book to help people lose weight naturally and more effectively, and we are offering it for free with purchases of our products. This book explains all aspects of a meal replacement diet in detail, and answers many frequently asked questions. Many sellers do not provide customers with full information about their products. This can cause unsatisfactory results or even damage one's health. 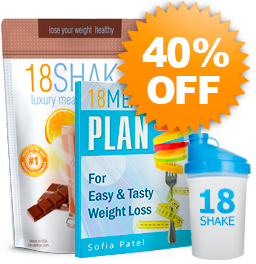 18Meal Plan, however, explains the specially developed diet that will help you reach your weight loss goals fast, quickly and tastily! 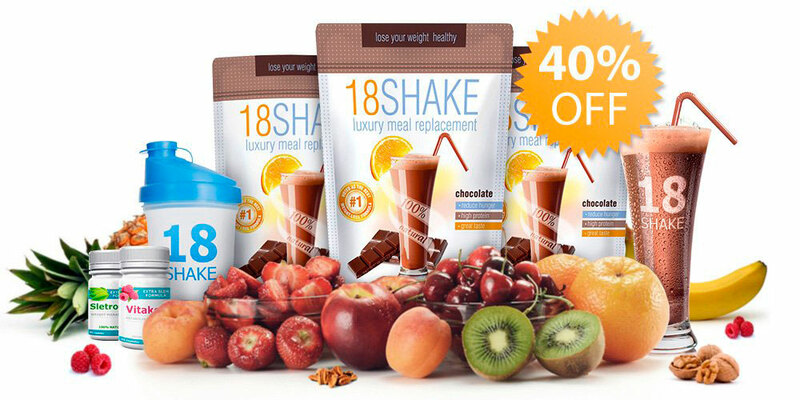 Compare New 18Shake with your daily products! I've been using this for over two years, and I have to say that it's an excellent way to get your daily nutrition without much difficulty. It's great for the winter because it helps me maintain my weight instead of stacking on those holiday pounds! 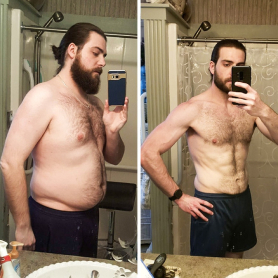 I started using 18 Shake in December 2014. Second photo was made in June 2015! I feel more energized when I use this drink. I usually have two shakes a day and a healthy meal for dinner. After trying 18Shake, I'm hooked. I won't use any other brand. I love the taste and that you can mix it up by using different flavor packets. Best of all is the weight loss I've achieved: just check my photo! We are very confident in our product because it was developed by a group of nutrition enthusiasts and weight-loss specialists. Years of hard work gave us a perfectly balanced meal replacement shake that we are proud to sell. If you are not satisfied with your weight loss results, we provide a 30-day money back guarantee! Restocking fee may apply. 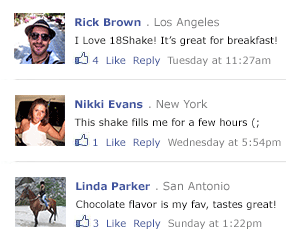 18Shake's effectiveness is further increased up to 76% when combined with an all-natural supplement called Sletrokor. This product has been endorsed by numerous medical professionals in recent years. Science has shown that its active ingredients such as Gymnema Sylvestre and Aloe Vera can help increase metabolism, help the body burn fat and stop weight gain. Sletrokor has antioxidant properties and is used to reduce weight. 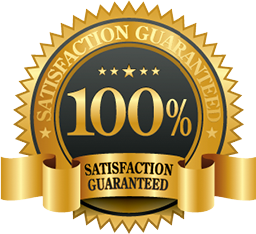 Yes, we offer a 30 day money back guarantee. No, we do not have auto-shipments, only direct sales, you buy more to save more. How many calories are there in a single serving of 18Shake? There are only 90 calories per serving. 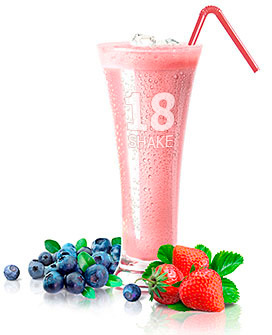 Do you have any special recipes to make 18Shake even better? Yes. Please visit http://18shake.com/recipes.php to find delicious recipes. If I'm drinking the shakes, do I need to work out as well to lose weight? Although it's not necessary to begin an exercise program when using 18Shake, as some of our clients have achieved weight loss without working out, it is certainly an added bonus and will aid you in living a healthy lifestyle. 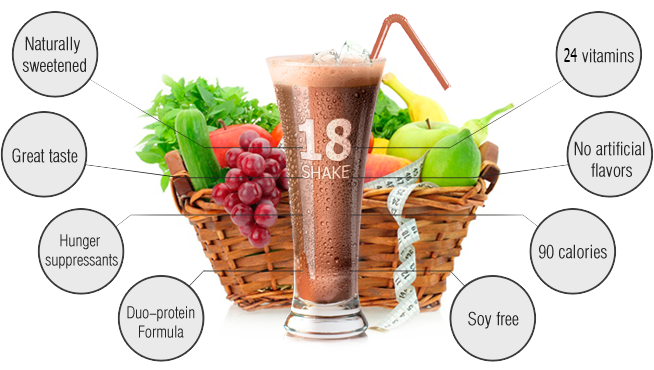 What is the shelf life of 18Shake? 18Shake protein powder has a 3 year shelf life, you can refer to the manufacturing date on the back of our shakes to calculate the expiration date, please remember to keep the shake bag sealed to ensure our products integrity. CHECK OUT OUR FAVORITE RECIPES! This is one of the best healthy shake recipes we've found! It's great for lunch or a late dinner. Combine all ingredients in the blender. Crush 4 ice cubes in blender. Add milk and then all other ingredients. It's a delicious, thick, healthy meal replacement shake! Green smoothies are so delicious, we think they might be addictive! Add all ingredients to blender except spinach. Press "pulse" several times. Next, add the spinach and blend on high for 30 seconds or until the smoothie is creamy. This shake is perfect for breakfast! It's refreshing and tasty. To avoid getting clumps of powder in your shake, add wet ingredients to the blender first. Then add the remaining ingredients (except ice). Blend on medium for one minute, and leave it out for a while if you want it to be thicker. Add ice cubes as desired. Makes 2 cups. 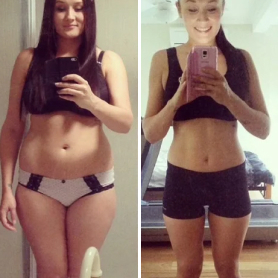 Join our mailing list and get secret weight loss techniques for free! © 2013-2019 18Shake.com. All rights reserved. *Results are individual and may vary. We cannot guarantee the same experience for every consumer. Free shipping only for people in the USA. **All Prices are US dollars USD. $47.99/bag price only for 'BEST SELLER DEAL'. These statements have not been evaluated by the Food and Drug Administration. This product is not intended to diagnose, treat, cure, or prevent any disease. Always seek the advice of your physician or other qualified health care provider with any questions you may have regarding a medical condition. Address: 3390 Deronda Dr Los Angeles, CA 90068. Not for use by children under the age of 18.